Spa was “the perfect warm-up for Le Mans” (as Rob Schirle commented last week), and the Cirtek team owner has now confirmed his drivers in the two Russian Age Racing entries for the Le Mans 24 Hours. #62 Aston Martin DBR9 David Brabham / Christophe Bouchut / Antonio Garcia. Both cars will race on Michelin tyres. So three British drivers in the Ferrari 550, and all three have raced at Le Mans before. Two have driven together before (Smith and Sugden), one is from the north (Sugden), one from the middle (Vann) one from the south (Smith) – and one has driven the same car before… well, the same type of car anyway. Did you work that one out? Tim Sugden raced what was then the sister chassis at the Le Mans 1000 Kms in November 2003, with Peter Kox – to second in GTS, behind the current Russian Age Racing chassis (then Veloqx / Care Racing), number 113136. 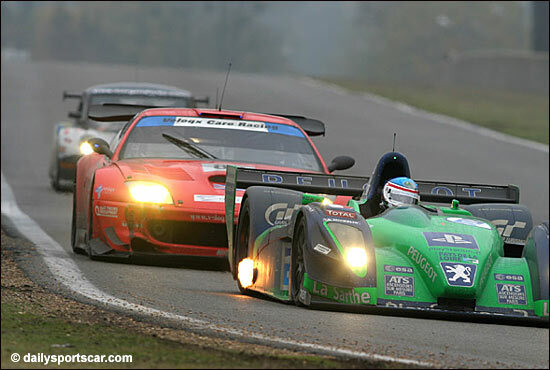 Here is 113136 back in November 2003, behind the second-placed Pescarolo (Peugeot-powered then). #61 will be racing in a bright red livery again. This is a chassis that has been red (Prodrive, Le Mans 2002), blue (Luc Alphand, Le Mans 2003), red (Prodrive, Le Mans 2004, the McRae car), blue again (Russian Age Racing last year) – and will now be red again. The Aston Martin, still entered by Russian Age Racing, but with Team Modena badging and in the grey and black livery, as at Spa, has the phenomenal Brabham / Bouchut / Garcia line-up, and will be out to take on all-comers in GT1. Rob Schirle may have been hoping for some kind of tyre advantage in the ‘Aston Martin GT1 battle’ – but it will be a more level playing field at Le Mans, we believe….